Yes, your pup might need some hiking gear, too. 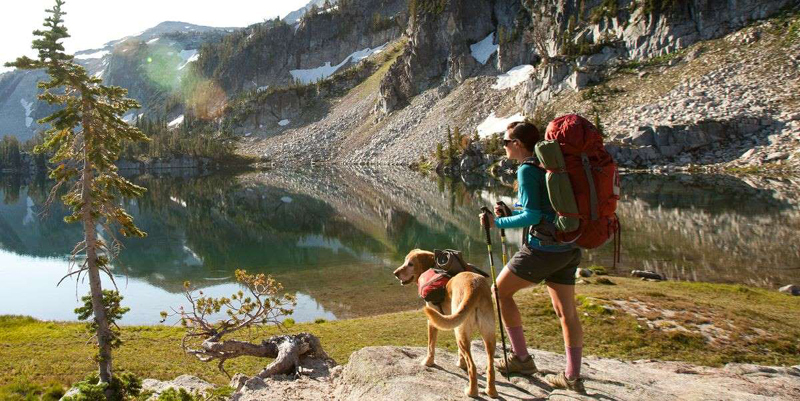 © Jordan Siemens From the best hiking dogs to dog-friendly hikes and trails to the best dog-hiking backpack, we compiled everything you need to know about hiking with dogs. Start slowly. You wouldn't attempt a 10-mile hike the first time out; neither should your dog. Also, consider your pooch's suitability: Breeds with short noses such as bulldogs and pugs overheat easily so they're not the best hiking buddies. Small dogs can hike but need help around obstacles. Senior dogs may not be as spry as they once were, so plan shorter trips. Ditto for overweight dogs. Don't forget to bring water and snacks for both of you. Prepare for the worst. Pack a doggy first aid kit, and program poison control into your phone: 888-426-4435. Suit up. Keep your dog current on vaccines and flea and tick protection. Light- or short-coated dogs can get sunburned, so ask your vet for recommendations on canine sunscreen because some human sunscreens are toxic if your pet licks them off. To make him more visible, outfit your dog with an orange bandanna or vest. Make sure he's wearing ID tags and that his microchip info is up-to-date, and bring his proof of rabies certificate (some parks require it for entry). Practice good pet-iquette. The excitement (and the smells!) of a hike can make even the most obedient dog go a little wild, so keep him safely leashed. In fact, many state and national parks and forests require leashes. In places where off-leash hiking is allowed, don't let him out of your sight. Call him back when approaching other hikers because not everyone wants a dog nosing them. If your dog goes poo, pick it up and carry it out. Or dig a "cat hole" six inches deep and cover it. And never let him harass wildlife. It may seem like great fun to him, but it won't go well in the case of critters such as venomous snakes, porcupines, alligators, or bears. Do a post-hike inspection. Look for burrs, paw pad injuries, and ticks. Bathe him if he went swimming to prevent waterborne illnesses such as leptospirosis.